This weekend Donald Trump massively accelerated the level of nonsense that has been the hallmark of his presidency. 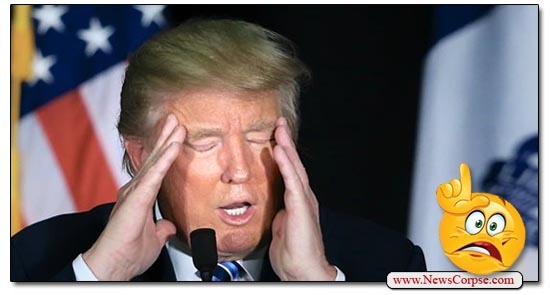 Among the cognitive lapses he displayed while embarrassing America in Europe were his defensive response to the indictment of twelve Russians for interfering with the 2016 presidential election, and his anti-First Amendment rebuke of the the “fake news” network CNN in favor of the “real” network, Fox News. But he was just getting started. There were several instances of acute mental confusion that Trump exhibited this weekend. But let’s begin with the most disturbing one, even though it may not be the most substantive. In an interview with British Trump-fluffer Piers Morgan, the President was asked “What is the incentive for America to do a great deal with the United Kingdom?” And this was Trump’s – – – answer? No. Nobody understands a single thing that you’re saying. But that’s only because you aren’t saying anything that is remotely intelligible. But other than that, it’s perfectly clear. Following the Putin/Trump performance review on Monday, Trump is now scheduled for a lavish tongue bathing by Fox News shills Sean Hannity and Tucker Carlson. Because who else would he turn to? And Vladimir Putin will also be visiting Fox News for an interview with Chris Wallace. So it’s an all-Fox, All Russia, all Trump festival of flagrant propaganda. I can hardly wait. No, Howard, be a bit more brave…the release of the 12 Russian military intelligence officers is just the spreading of the icing, for it is a Mueller prelim of what next is to come and that is Trump administration indictments that will lead to Trump himself. Trump will either resign or be impeached due to the insurmountable evidence against him where lying will no longer warrant anymore narcissistic bailouts. We nneed to pay close attenion to these american traitors. At some point in this country, their day of reckoning will come. Its sad, but America is headed for another “uncivil war.” I’m sad to say this but its true. The fake president is not just an egomaniacal greedy corrupt businessman. He is a TRAITOR to EVERY VALUE, STRUCTURE, POLICY, and Governance SYSTEM that has made this country a democracy. He is more loyal to putin than to the Constitution. His ignorance is dangerous. No one of reasonable mind, or moral ethics could ever root for Trump and this article poignantly points that out.